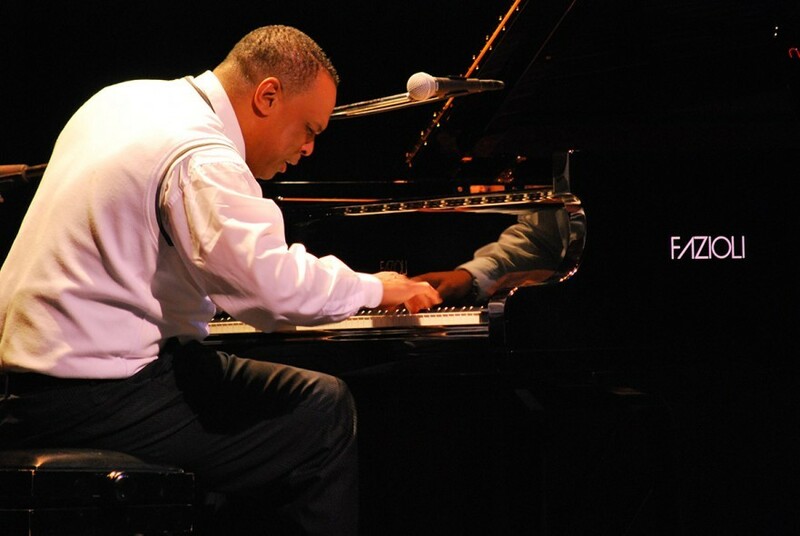 Cuban Pianist, composer and arranger Jesus “Chuchito” Valdés, is the third-generation manifestation of a Cuban jazz piano dynasty that includes his father, Chucho Valdés and grandfather, Bebo Valdés. Born and raised in Havana, Cuba, The oldest of five siblings, Valdés was a child prodigy, attending and graduating from La Escuela de Musica Ignacio Cervantes. He had his first professional gig at the age of 16, working with Cuban singer and trumpeter Bobby Carcasses, and also accompanied singers Pello El Afrokan and Anibel Lopes for a time. In the mid 80’s Chuchito Valdés was a member of the Cuban jazz combo Sonido Contemporaneo, and by the late 90’s he had taken his father’s spot in the renowned Irakere band when the elder Valdés opted to go solo. Eventually Chuchito followed suit, leading his own band and touring behind his fiery brand of Afro-Cuban Jazz. Chuchito Valdés released a debut album, Encantado, in 2002 on Town Crier Records, following it with La Timba in 2002 and Herencia in 2004, both on J&N Records, and Keys of Latin Jazz in 2007, which was nominated for a Latin Grammy from Sony BMG International. Then followed with Cuban Dreams in 2009 which was also nominated for a Latin Grammy, the same year he also released the Prince of Latin Jazz. In 2010, released Viva El Sonido Cubano New York is Now which was nominated for a Grammy. In 2012, he was also nominated for Chuchito Valdés Live in Chicago and also for Chuchito Valdés Piano Charango . In 2013, he released Grand Piano Live Piano, which was nominated for a Latin Grammy and in the same year, he also released Carnaval en Piano Charango which was also nominated for a Latin Grammy. Chuchito has also performed numerous festivals, clubs and concerts throughout the world: from Cuba and the Caribbean to North America, South America, and Europe. Chuchito is recognized as a master of Cuban music including Son, Danzon, Cuban Timba and Guaguanco. Chuchito Valdés is currently residing in Cancun Mexico, and he is a frequent performer in Europe, Canada and the United States. Chuchito Valdés, following in the footsteps of his famed father Chucho Valdés and grandfather Bebo Valdés, continues the legacy of great piano players form Cuba. With influences of Caribbean rhythms and jazz, Chuchito creates an exciting and energetic blend of spicy music that drives audiences wild. This piano master captivates with his sensitivity and drives excitement with his dynamic band. Chuchito has recorded and performed piano with the world renown Cuban band, Irakere, which he led for 2 years. He has also performed at festivals, clubs and concerts throughout the world: from Cuba and the Caribbean to North America, South America, and Europe. Chuchito is recognized as a master of Cuban music including Son, Danzon, Cuban Timba and Guaguanco. He has also extensively studied classical music including harmony and composition. His original compositions and arrangements draw on classical harmonic and structural techniques. In his performances, Chuchito’s music draws on many styles including Afro-Cuban Latin Jazz, Bebop, Danzon, Cha-Cha-Cha, Son Montuno and much more. Chuchito Valdés currently resides in Cancun, Mexico and is a frequent performer in the United State and Canada.